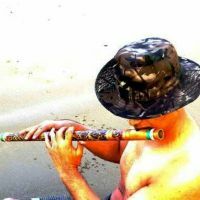 FluteFreedom, is a Rock/Jazz/Pop/Soul/ Wind Instrumentalist / Singer / and Arranger. His music is best described as Cross over of western,Eastern, traditional, folk & fusion which is a style that cross musical genres. It is spiritual, mystical & relaxes your body soul & mind. His music is a testimony of what the God has brought him through and what the God will do for you when you surrender to him. He is thankful to Dr.Len from Ohio ( USA )for being his Mentor, who has been playing all the wind instruments for the past 50 years, retired Dean of music school. Also he thanks Mr.Richard Stoker - U.K., He was teaching composing in “Royal Academy of music school - London, who has composed few songs, which he has played & created videos. He is blessed by both of them to be where he is now, he is also thankful to all his fans for having made his musical journey memorable & enjoyable as a Musician. He wishes to meet musicians from around the world to share learn & create good collaborative music.